We can offer a wide selection of Luxury Fully Crewed Sailing yachts and Catamarans for crewed charter in Greece and the Greek Islands that combine exhilarating performance under sail with the ability to motor at speeds of up to 10 knots should there be no wind These Yachts combine economical passagemaking with with luxurious facilities to enjoy the peace and quiet when the engine is turned off and you sail on..
For Motor yachts & motorsailers see menu left or below. 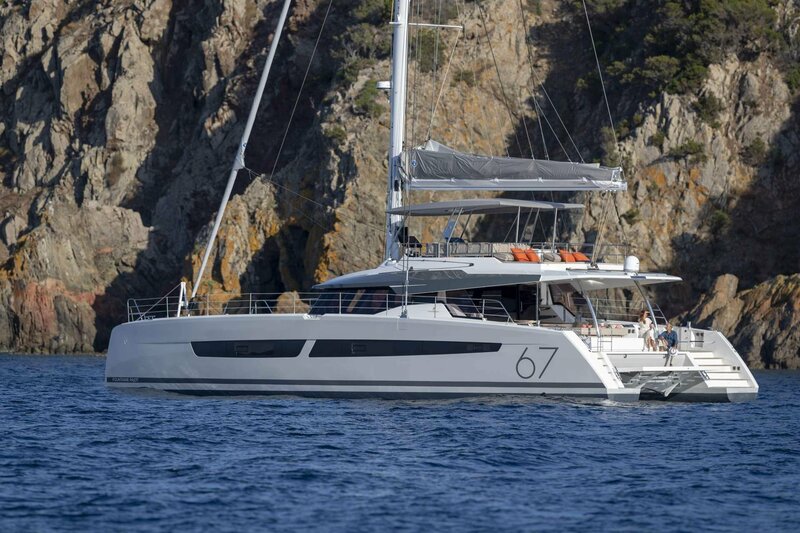 NOVA Lagoon 620. for Crewed Catamaran Sailing holdays in Greece. For 8 Guest in 1 master suite, 2 double cabins, 1 twin bunk cabin, all en-suite with A/C. Dedicated crew of 3. 60hp Rib tender, Adult & kids waterskis,Kneeboard, Kayak, Tubes, Paddle board, Hydraulic bathing platform. E-Brochure. SELENE. 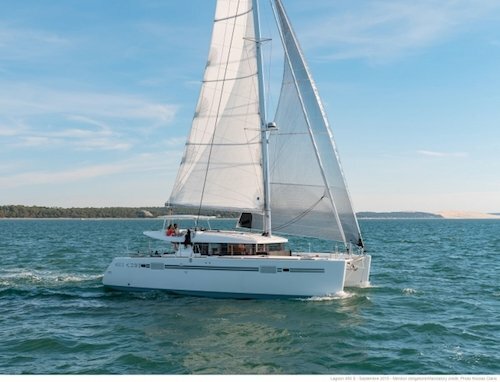 Lagoon 620 Catamaran. For up to 10 guests in 5 double, en-suite cabins with A/C. Experienced freindly crew of 3. 50hp Rib tender, Adult & kids waterskis,Wakeboard, Kneeboard, Kayak, Tubes, 2 x Paddle boards, Hydraulic bathing platform. Selected dates still available including one-way Athens - Corfu, Lefkas - Lefkas, Corfu-Corfu & Corfu Athens. E-Brochure. ALYSSA. 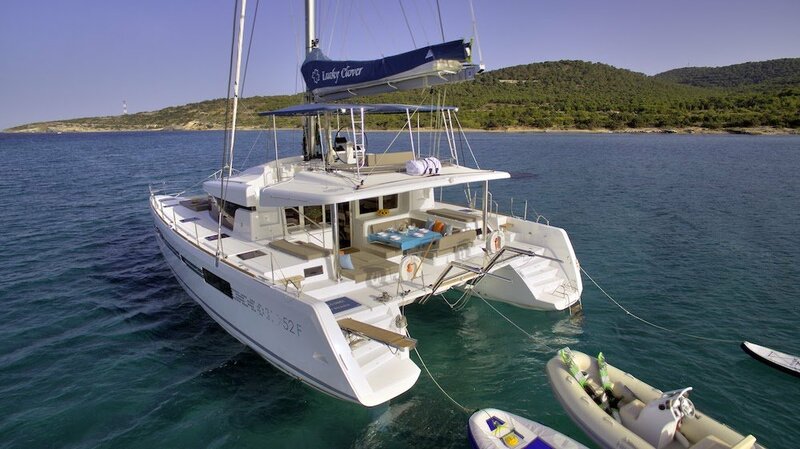 Unique Lagoon 560 catamaran charter, in Greece. up to 10 guests in 5 cabins, Full A/C, crew of 3 in separate quarters, Fully air conditioned, 50hp tender, waterskis, wakeboard, Paddle board, Kayak, etc. available for charters from Athens & Mykonos for 2019. E-brochure. Weekly charter rate: €18,000 - €23,000 + 12% VAT + expenses. 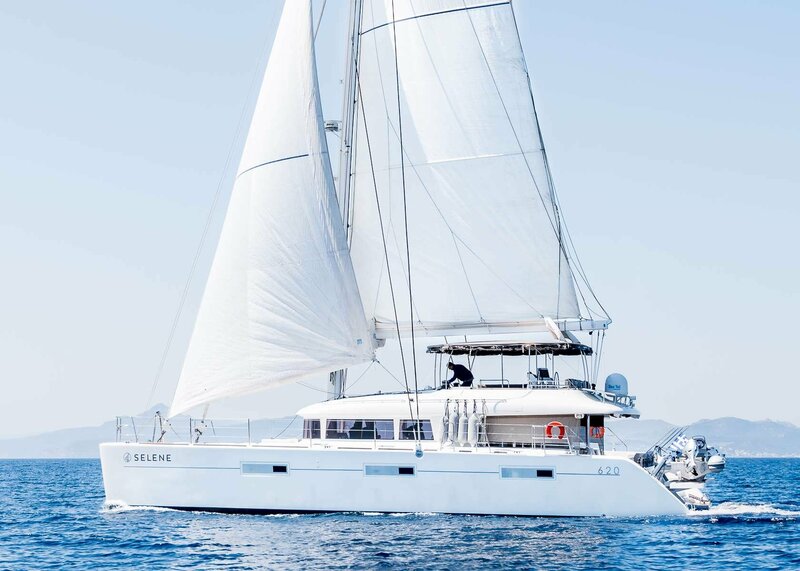 LUCKY CLOVER, Experience this New model Lagoon 52 for charter in Greece. Offering excellent value. Sleeps up to 12 pax in 6 air conditioned en suite cabins ( 2 master, 3 double, 1 twin bunk). Crew of 2 or 3 in separate accomdation. 50hp tender, waterskis, tubes, kayak, paddelboard, etc etc. E-brochure. IDEA! 50'/16m. 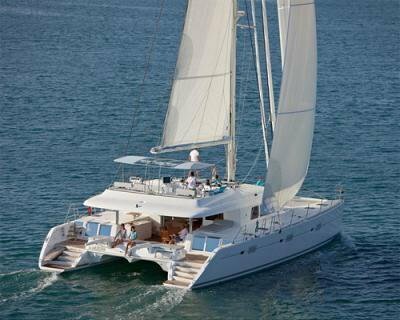 Crewed catamaran for charter in Greece. 4 double bed one twin bed cabins all with en-suite facilities air-conditioned through-out large decks fly bridge water maker speed boat water ski tubes kayak LCD TV DVD under water lights for night swimming and many toys. Crew of 2 at your service. 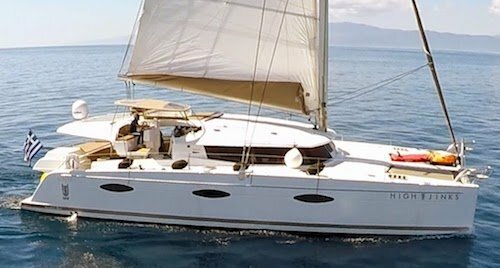 BUENA SUERTE, 48ft/14.5m Skippered catamaran for charter in Lefkas, Ionian. 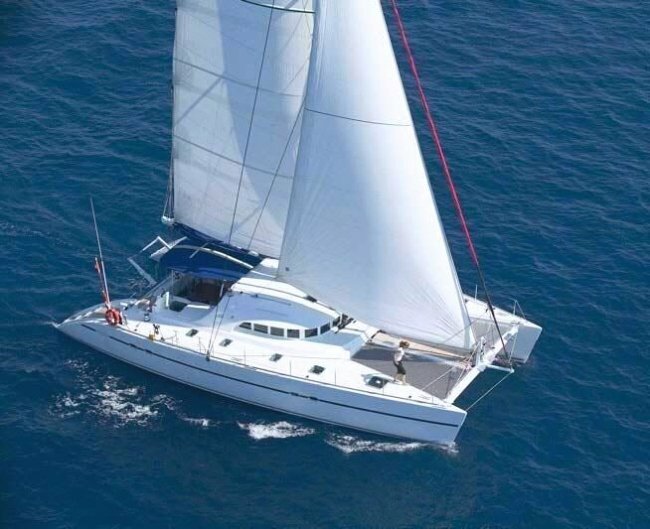 Excellent value for up to 8 guests in 4 Air-Conditioned cabins & a superb skipper ! 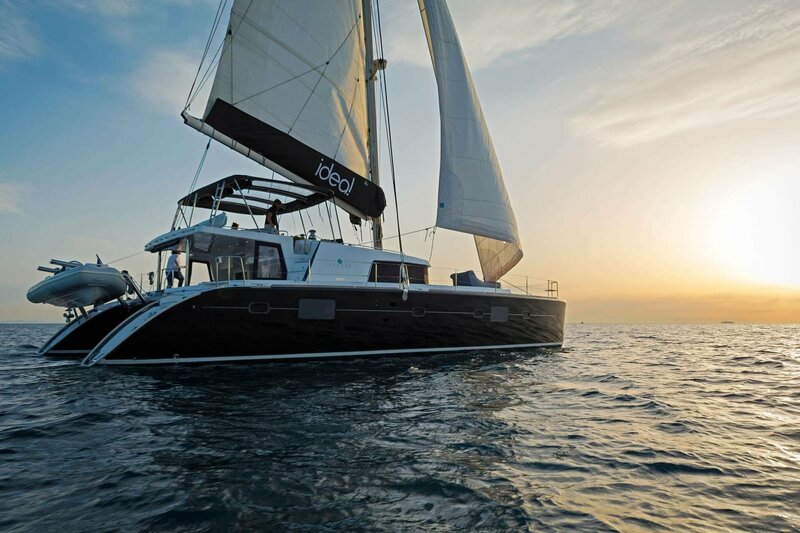 DANIELLA II, 2016 Lagoon 450s Catamaran for crewed charter in the Aegean. Ideal for families. Sleeps up to 8 guestst in 4 ensuite duoble cabins, fully Air conditioned and an excellent crew of 2 in separate acomodation forwards. 40HP Tender, Adult & kiids waterskis, Tube, Kayak, fishin gear etc. 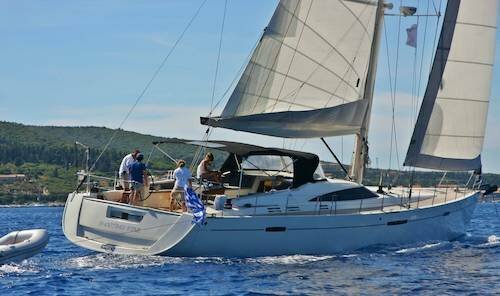 S/Y Shooting Star, 64' Luxury sailboat with Crew for charter, Athens & the Greek islands. Adaptable layout, with large master suite forwards, or up to 8 +2 guests in 5 Air conditioned en-suite cabins. Crew of 2 in separate quarters. 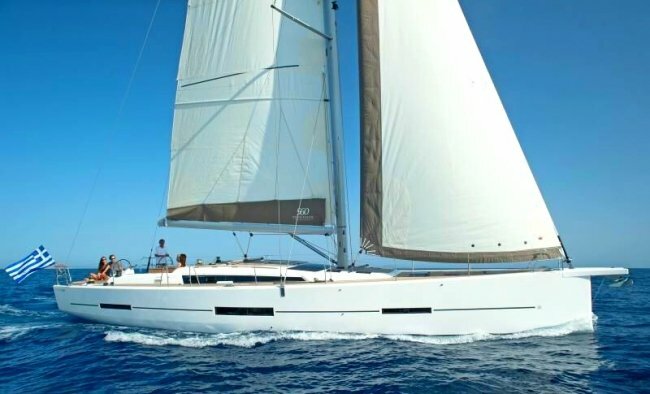 S/Y MYTHOS, 59'/18m Sailboat for charter with crew. Sleeps up to 8 guests in 4 cabins, British crew. S/Y PHARIA, Beautifull Hanse 575 Yacht with Skipper for charter from Athens ( other ports on request). Accomdation for 6 guests in 3 en-suite, cabins, Full A/C, Seperate skippper accomodation, Hostess/Chef available at extra cost. 100hp JetRib tender, Waterskis, Tube, Fishing gear,. Weekly charter rate: Euro 7,500 - 11,500 +12% VAT + expenses. S/Y MIMOSA, Dufour 560 Sailboat with skipper in Greece, the perfect balance of value, performance, style, and comfort. She can accommodate 6 guests in a large master cabin and 2 double guests cabins. She is offered with Captain and on request with Cook/stewardess. 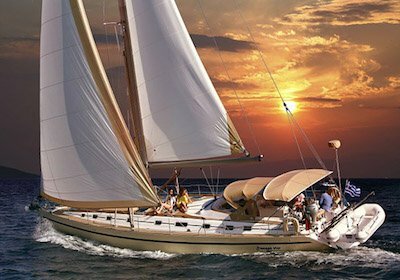 The yachts found on our database are by no means all the yachts we are able to offer. In Greece, we have many more, but not enough time to lsit them all !. 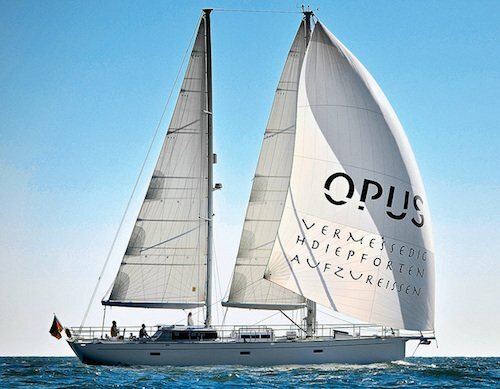 Once you have identified some yachts that are suitable, please contact us, listing the yachts of interest,with your required dates and preferred start/finish port, we will then confirm availability, charter rate & terms and also offer any other similar yachts that we know will be available at that time. We look forward to hearing from you !. ..